Mine internal monologue is pretty constant, but in public it usually happens when I ride the Muni. Typically I'm sweating profusely and panting because I just ran to catch the N-Judah (somehow I'm always late) and now I'm trying to appear relaxed and cool amongst the oh-so California-cool folks. My Muni-logue: How do I stand? Do I look around too much? Should I do something with my phone? There's no wireless here. Don't look at people. You are staring at that woman's purse. It's really cute. I'm sweating, gross. Don't look at your reflection in the window that's weird. Should I stand and lean or hold onto the bar? What if I have giant sweat stains on my shirt? Is this shirt stupid? Why can't I get my scarf to stay in one place like these other girls? Everyone here has awesome boots. I wish I had awesome boots. I wish I had remembered a book so I could look smart while reading. Am I in someone's way? I think I just poked that person's backpack. Oh god. Which way will the doors open? I wish there was a seat. Oh, god can people tell I'm from the suburbs? Why does everyday still feel like middle school? Damn, my pre-teen years were traumatizing. 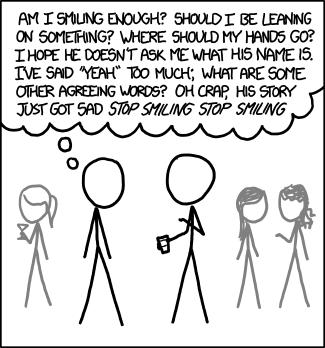 Thanks xkcd for illustrating my awkwardness.